Headlamps come in many shapes and sizes, and which headlamp will work best for your needs will largely depend on what you like to carry with you while you travel. If you tend to go on shorter hikes or keep a battery pack with you on short multi-day trips, a rechargeable headlamp may be the way to go. However, there are many different options, and they all have various features worth exploring. To help make your decision easier, we’ve gathered up all of the important details about the Zukvye Super Bright Rechargeable Headlamp. Is this headlamp the right one for your personal needs? Let’s take a closer look at its pros, cons, and other notable features to find out. For you to better understand what the product offers, let’s move on to talking more in detail about the features of the Zukvye Super Bright Rechargeable Headlamp. By alternating between these modes, depending on what situation you are in, you will be able to customize the lighting experience to be exactly what you need while also conserving battery life when you don’t need to use full brightness. If you use the headlamp only in energy saving mode, you can expect the lamp to last for about 15 hours, which is a considerable amount of time. Consider using this mode when you don’t need full brightness to ensure your lamp lasts for as long as possible. Additionally, the lights themselves can be rotated at up to 90-degree angles. This ensures that no matter which direction you’re moving in, what you’re trying to see, or where you’re going, you will be able to light the path ahead of you brightly. A big con, though, of having a headlamp with five super-bright LEDs is how fast they can eat up their battery life. If you are using the headlamp in full brightness mode, the batteries will only last for six hours or less before they need to be recharged. This is not enough time for most hikers on multi-day trips, so you will have to be smart about how frequently you use the full brightness mode. Though this model advertises a combined power of 8,000 lumens, it’s important to understand that each light gives out a certain number of lumens that the manufacturer is adding that together to create that 8,000 lumens. Light does not truly combine this way, so you’ll get the light output of more like 1,000 or 2,000 lumens. Still, this is much stronger than most headlamps in this category. Charging this headlamp is relatively easy, but it has to be done somewhere with electricity. Simply use the included USB cable to link it up to a computer or other wall charger, such as a compatible phone charger. It will usually take up to three hours to fully charge. One problem with the batteries is that you cannot simply swap them out. You must plug the whole headlamp battery pack into a USB charger to charge the energy up again. This can be inconvenient if you like to take long hikes without regular access to electricity. This product is IPX5 waterproof, which means that it can stand up to standard splashing in terms of water resistance, but is also fine to use in all different types of rainy weather without any worries about the device being ruined by the rain. Do take note though that you cannot soak it in bodies of water. This headlamp from Zukvye won’t be perfect for everyone, but many alternative headlamps might suit you instead. If you’re looking for something with a more extended battery life and illumination range or one that puts less weight on your head while hiking difficult terrains, you may want to consider the HOTFS LED Headlamp. This headlamp is very light and has an attached, external battery pack. This means that you can carry the battery itself in your pocket, inside your backpack, or on your belt. For those who are climbing uphill or have neck problems, this can be a huge benefit as it removes much of the strain that can be placed on your neck by heavy headlamps. Just keep in mind that as compared to the Zukvye model, the HOTFS LED Headlamp only has two light modes, a waterproof rating of IPX4, and an angle adjustment of up to 45 degrees. 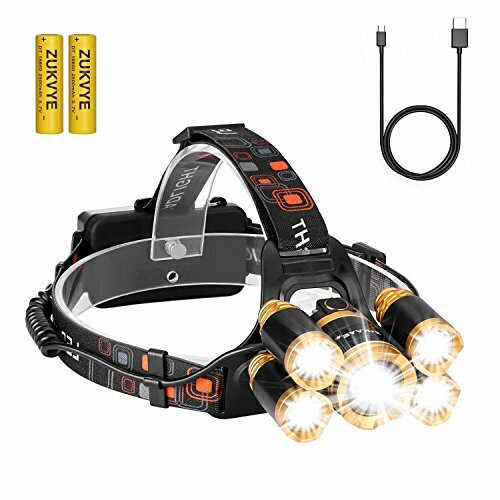 Overall, the Zukvye Super Bright Rechargeable Headlamp is a superb option for hikers looking for a bright, super functional, easy-to-use, and rechargeable headlamp that will ensure they can see while they are on the trail at night or moving through camp to get things accomplished at night. While it doesn’t quite live up to the 8,000 lumens promise, this light is super bright and offers multiple light modes. Additionally, the light angle and size are both adjustable, and you can make these adjustments with ease. A simple push of the button changes the light mode, and the size can be adjusted with easy-to-move straps. This headlamp doesn’t have the best battery life but is good for trips shorter than three days. Hence, if you want to see around camp or do some night hiking, both will be possible with this headlamp from Zukvye. We hope you found this deep dive look into the Zukvye Super Bright Rechargeable Headlamp useful and informative. There are a wide range of headlamps to choose from on the market, with all sorts of options ranging from the basic to the more complex. Before you choose what to go with, be sure to be clear on what your needs are, for example, do you just need a bit of light for a light trail night hike while walking your dog, or do you need to have decent visibility on a deep and dark mountainside miles from civilization.